It’s time for another book review. So as I have said I have been trying to read more and I have a list of books in my trusty notepad that I haven’t read and want to read and I am slowly working my way through it. This book was actually a recommendation by my friend who said it is in her list of books everyone should read and after finishing it I truly agree with her. The book is called ‘Every Day ‘ by David Levithan and it is brilliant. The book follows the story of A who wakes up in a different body each day and has to live their life. In one of his bodys A falls in love with a girl called Rhiannon and throughout the book we see the struggles that they go through as they try to see if love truly can conquer all. Although this may sound like your typical love story I can assure you that it is not , it is much more than that. Yes A’s love for Rhiannon is a central part but we see Levithan deal with many other social issues throughout the book. We don’t know whether A is a girl or a boy or just a spirit but to make this easier to explain I am just going to say ‘he’. A has no control over which body he will be in on a given day ,all he knows is that they are all around the same age as him. The thing I found most interesting about this book is the broad range of people who A occupies. Some are male , some are female, some gay, some lesbian , some identify as their opposite gender, some have easy lives, some have hard lives, some are religious, some are not but they are all people and they all have feelings that A tries to respect. He is only in the body for one day and he tries not to alter their life in a major way although we see how he begins to struggle with this. The way in which Levithan deals with all of these social issues within the story really makes it extremely interesting to read. I also found myself thinking about my own life and how I would feel if I woke everyday as myself but in someone else’s body never having a life of my own to live. I think that this should be a book on everyone’s ‘To Read List’ as I thought it was truly amazing. Although I felt the ending was a little disappointing it didn’t take from my love from the story as a whole. 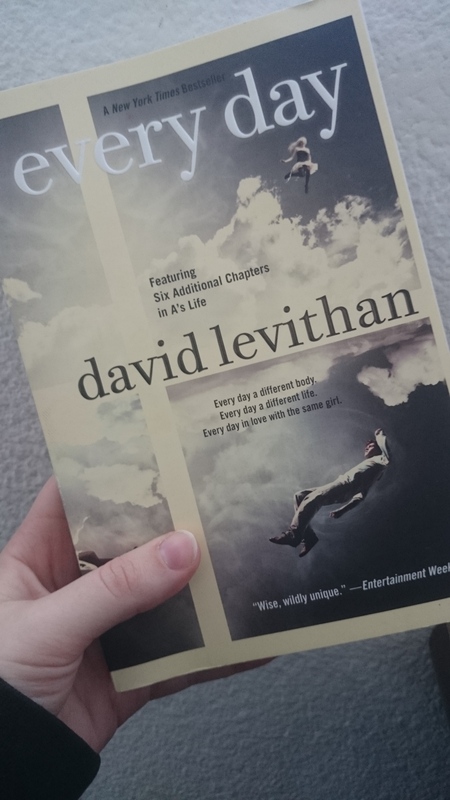 There is also companion to this book called ‘Another Day’ in which David Levithan tells Rhiannon’s side of the story so I can’t wait to get my hands on that and read it. Let me know what you thought of this book if you have read it or if you have read ‘Another Day‘.